How Can Libya Avoid the Fate of Iraq? Was Syrian President Bashar Assad one of the millions around the world who watched Libyan revolutionaries triumphantly stream into their capital, Tripoli, on Sunday night? Did the sudden collapse of most of the Libyan regime's defenses in and around Tripoli cause Assad to feel a heightened sense of anxiety? It's impossible to tell but the Twittersphere certainly drew parallels between the two regimes, with many jubilant commentators predicting that the young Syrian President would be the next Arab leader toppled by his people. If events in Libya are causing Assad to reconsider the wisdom of his current campaign against Syrian protesters it was not evident in an interview he gave on Syrian state television just hours before the momentous events in Tripoli. In a well-scripted question-and-answer session with two journalists  Assad's fourth televised appearance since pro-democracy activists first took to the streets in mid-March  the President appeared as disconnected from the gravity of the antiregime movement as he has ever been. Assad gave no indication that his security forces would soon end their punishing offensive, which human-rights activists say has left more than 2,000 civilians dead. Instead, he said that although the solution to the crisis was ultimately political, "there are security situations that require the use of the security institutions." His forces were making inroads against the protesters, he said, adding that the antiregime activists have "become more militant in recent weeks." But "we are capable of dealing with it," Assad said. "Yes, things are better now. I am not worried, and I want to reassure everybody." Perhaps the young ophthalmologist who inherited the presidency from his strongman father should be a little more concerned. The more blood is spilled, the harder it becomes for Assad to find the political solution he says he wants. Protesters have already made it clear they do not see a place for Assad in Syria's political future, and in fact, many are now calling for his execution. Suhair Atassi, a prominent activist currently in hiding in Syria, said Assad's repetitive speeches provided "the greatest support" to the opposition's bid to build a "free democratic Syria," by drawing more people into the opposition's fold. Protesters across Syria took to the streets following the President's speech last night, in some areas reportedly chanting, "Gaddafi is gone, now it's your turn, Bashar!" Activists have long dismissed Assad's promises of political reform, and last night's speech did little to change their assessment of Assad's sincerity. "He talks about reform and national dialogue," said one activist, Mohammad, a 24-year-old from the flash-point town of Zabadani, on the outskirts of Damascus. "But all of these reforms he's promising now were pledged in 2005, and as for dialogue, am I supposed to talk to the soldiers in the tanks in my street?" 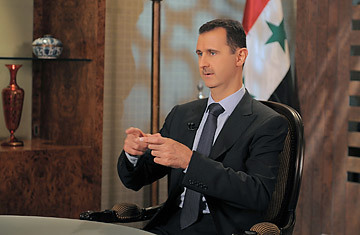 Assad's harshest comments were reserved for the international community. "Why was the West's reaction to your reforms negative?" one of the government-employed journalists asked him in a reverent tone. "No matter what you do, they would still tell you it is not enough," Assad replied. He dismissed growing calls from the U.S. and Europe for him to leave office, branding them as "meaningless." "This cannot be said to a President who was elected by the people," said Assad, who, like his father Hafez before him, and many other autocratic Arab leaders, occasionally goes through the motions of being elected in contests where there are no other candidates. "It can be said for a President who was brought by America and to a people who are submissive to America and take orders from it." Although Syria's state news agency SANA on Monday interviewed several little-known or low-ranking Middle East personalities who lauded the President's speech as "clear, frank and comprehensive," international reaction was predictably harsher. British Deputy Prime Minister Nick Clegg said Assad offered "the same, well-worn promises of reform" and was "as irrelevant to Syria's future as Gaddafi is to Libya's." Britain's Defense Secretary Liam Fox also weighed in, telling BBC radio that Assad would "be thinking again in light of what has happened in Tripoli overnight." As he spoke last night, looking relaxed in spite of the violence that continues to flare throughout his country, Assad implied that the region's stability depended on his survival in power. On several occasions he flagged Syria's "key geographic location," code for its border with Israel, and warned that "anything harming Syria will have a negative reaction on a number of countries." The U.S. and Europe have recently tightened the screws on Assad, imposing new sanctions and threatening others. Still, the defiant dictator brushed them off, saying that if the West were to place sanctions on his regime, he'd turn East: "Today, alternatives are available." Perhaps Assad would do well to ponder that point. Today, alternatives to despotic regimes are indeed available, and the Syrian opposition is furiously trying to position itself as just that. See pictures of Gaddafi's 40-year rule.